This is the time of the year when it’s hard to overlook the signs of approaching winter. Geese are on the move, and our big pond is quickly becoming both crowded and noisy. We had an unexpected and unpredicted thunderstorm last night that dumped a half inch of rain, not to mention blowing off a lot of leaves and treating us to quite a light show. One air to ground strike hit in the creek bed just north of the house. We haven’t had a frost yet, and the garden is still producing summer veggies, but I know we’re living on borrowed time. The animals feel fuzzy rather than sleek when you stroke them. But the most obvious signal of fall is the ripening apples. Our long-abandoned and uncared-for trees have been gradually making a comeback, and this year has been one of those high-yield years that have left us swimming in fruit. Our orchards have a number of trees I recognize and some I don’t. The trees are old enough that the odds are high we have some of the truly old-fashioned heirlooms, as well as the more familiar Red and Yellow Delicious beloved by the grocery industry. Although I must say, even these trees don’t really taste like the store-bought variety, probably because we don’t irrigate them. The apples are smaller, but the flavor is more concentrated. In addition to these, which are fairly sweet, we also have some trees that produce what I would call a cider apple — more of a tang, and even verging on bitter. A really good cider is usually a combination of multiple apples; vary the proportions and the flavor changes as well. I have an older model juicer, and my daughter acquired a bigger, fancier (and harder-to-clean) juicer this year, so there’s lots of apple juice floating around the homestead. Pears are also ripening, and pear juice mixed with apple juice makes for a yummy breakfast drink. The abundance of apples has given me the opportunity to re-indulge in a project I have long had on my list while waiting for a good fruit year — making apple cider and cider vinegar. Wipe jar edges, seal jars and process in a water bath for 5 minutes (pint and quart jars). At altitudes above 1,000 and up to 6,000 feet, make that 10 minutes. 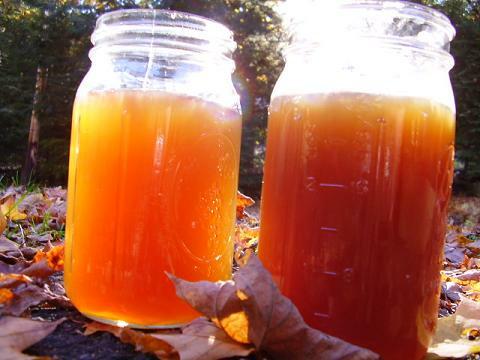 To make cider vinegar, you make apple juice (use the juicer or crush your apples — don’t cook, as you want raw juice). You can add a special yeast to the juice, let it sit on the counter to acquire wild yeasts or add some “mother” from a batch of raw vinegar. Place in glass containers, cover with cheesecloth or set lids on but don’t tighten, stir daily and let it ferment for 3-4 weeks at a temperature of 60-80 degrees. Taste test periodically. You can also just pile your apple scraps into a glass bowl, give them a day or so to turn brown, then place in a gallon jar, cover with cheesecloth, and fill the jar with water. Let it ferment in a warm dark space for about 6 months. strain through several layers of cheesecloth or a coffee filter (takes forever!) and let it sit, covered with cheesecloth, for another 4-6 weeks. Store in the fridge to prevent it becoming too strong. Don’t use it for canning, as you can’t be sure of the acidity. This entry was posted in Farms, Food, Recipes and tagged apple cider, apple juice, apple season, apples, cider vinegar, fall, pears, thunderstorm. Bookmark the permalink.